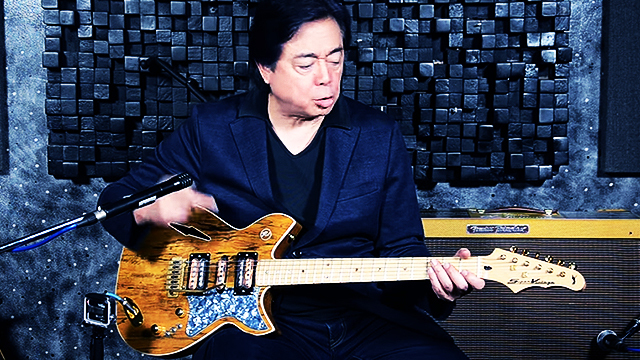 The RJ SuperVintage 5-guitars-in-1 solves one major dilemma for guitarists and will be the first Philippine-made guitar line to launch on a global scale. Borne out of a guitar player's dilemma, the RJ SuperVintage™ is set to make waves internationally as the first Philippine-made guitar line to launch worldwide. Dubbed the "holy grail of guitars," the brainchild of local music icon RJ Jacinto encapsulates the five primary and distinct guitar tones of the Fender Telecaster, the Gibson Les Paul, Fender Stratocaster, Gibson ES335, and the Fender Jazzmaster. The reason for this, RJ shares, is for musicians to avoid the hassle of switching guitars mid-gig, which he feels "kills the show's momentum." Originally introduced here in the country a couple of years ago, RJ Guitars actually had no plan of releasing the SuperVintage worldwide just yet, until it caught the fancy of one visiting guitar virtuoso, English pop duo Go West's Richard Drummie. It originally retailed for P25,000. Handcrafted from the finest Philippine mango wood handpicked by luthiers—led by one of the best in the business, Masayuki Takaesu—this musical synthesis religiously adheres to high Japanese standards. The RJ SuperVintage™ will be part of this year's National Association of Music Merchants show from January 21 to 24, at the Anaheim Convention Center in Anaheim, California.